A recipe for a perfect day or weekend for me usually involves: Athletic Activity + Acro + Sunshine + Friends + Great Food. 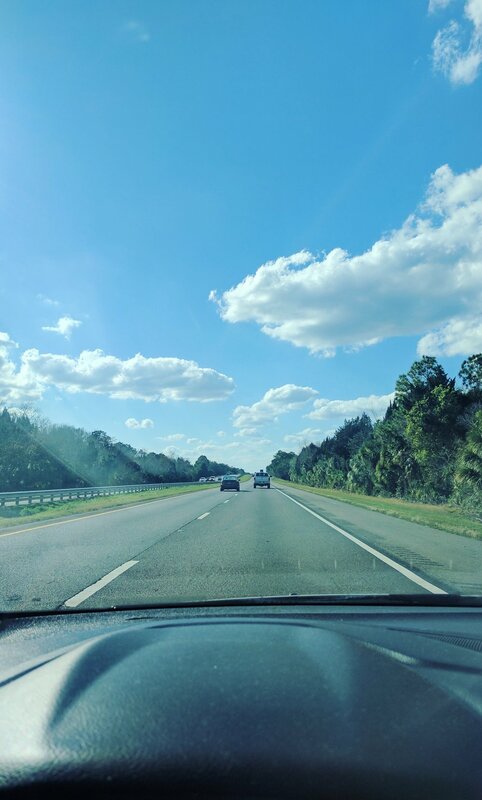 My recent road trip across Florida to visit my friend Katie had all these ingredients + A Few Surprises. St. Petersberg is not like the rest of Florida. I'd maybe even call it the Austin or Portland of Florida. For starters, it is way more liberal than the rest of the state. It's about as hipster you can get and still be in Florida. The population is young, more punk/hippie and less ex-military, conservative than the rest of the state. There are tons of tiny, independent businesses, and a really fun, community-oriented vibe. Everything interesting feels close, big chains haven't overtaken the footprint, and rents are reasonable. And the Acro Community is Wonderful. I arrived Thursday night to a jam at the GreenBench Brewery. Greenbench has this great, grassy outdoor space, with murals and twinkle lights. By the time I got there it was almost twilight, but the space was bright and full of energy from acrobats, families, puppies and polite drinkers. I briefly hopped up on Andre's feet - he's doing a project where he wants to base 100 people in foot-to-foot in a week. I was number 74. Yay! Image Courtesy of AcroYoga Tampa Bay and Beyond, edited by Mary Ho. Dinner was at a sweet little spot called Bodega - part juice bar, part Cuban takeout. I got the veggie plate - and I must say, it was probably the best tofu I've ever had. Add black beans, sweet plantains, and some bright and crunchy jiacama-mango salad, and you have one happy flyer! Friday, Katie and I both spent the day working at her place. I occupied her cute new desk, then made us a fancy picnic lunch. At 4 I had barely finished working (okay, I hadn't finished at all) when Katie and I went into serious tornado mode - sweeping through the house - packing like crazy people - to make it to Yoga in St Pete. 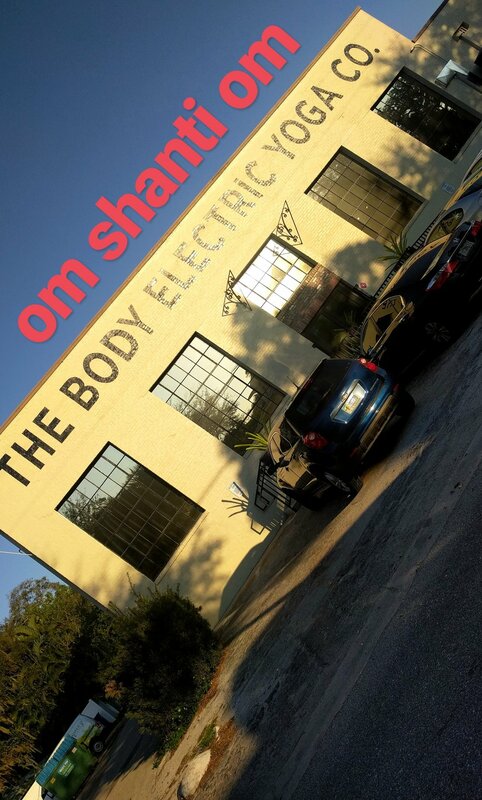 Rocket Yoga at The Body Electric, to be precise. I recently got into rock climbing... I went to the new Brooklyn Boulders Queensbridge in NYC and absolutely loved it. I had climbed before, years ago, but I think the way I've gotten strong in the last year has made it a lot more fun for me. Turns out lots of acro people like climbing; we arrived at Vertical Ventures and ran into many more people we knew. Vertical Venture was pretty fantastic; every time I walk into a new climbing space, I feel like a kid in a candy store. 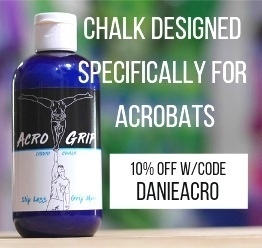 Acrobatics and Handbalancing is mostly a pushing action, and climbing has more of a pulling focus; thus, it's a perfect cross train for what I do. And did I mention it's super, super fun? Fast forward to Saturday- Katie and I crashed with Chris, an acroyoga-climber, who has a big weird house in St. Pete. His aunt flips houses, and he's living in this one and helping to fix it up. Saturday morning, Chris spoiled us with mango and avocado toast (and coffee for the resident addict - yes, hello, that's me! ), named a park about a mile away, and told us to follow him for some acro. This park is called Sawgrass Lake and it's not really a park so much as an ALLIGATOR PRESERVE. 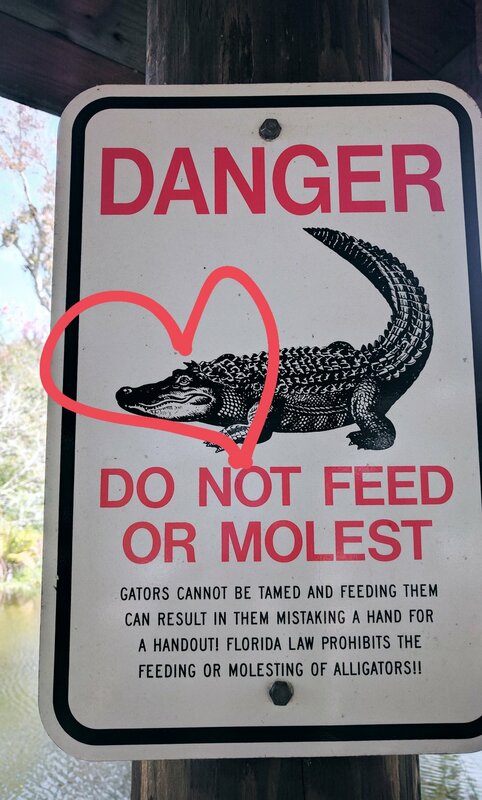 Yes, you heard me, gators. Evidently, they are unavoidable in Florida. As we walked along the elevated wooden pathway, we saw lots of cute little gator babies, roughly the size ofbeanie babies. Then Katie gave a shriek. Mama was slowly creeping out into the viewing areas from underneath the wooden walkway. Suddenly, they didn't seem so cute anymore. They seemed like baby killers. At the end of the wooden walk way was a 2 story platform. We climbed to the top, threw down the mats, and voila! 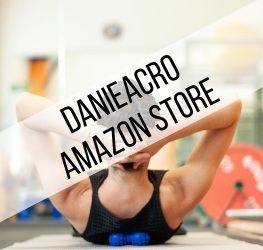 Acro! I learned a new low flow and then a Girl Scout troop showed up, and fell in love with Katie. She's pretty amazing with kids... so we ended up flying the girls, and teaching some of the moms to base. They simply could not get enough. They left, and Chris had another engagement, so Katie and I trained handstands, watched the water, and discussed the rest of our epic weekend plans. We may look serene, but we're plotting shenanigans. Next up was festival #1 of 2017... Localtopia! Localtopia is St. Pete’s largest “Community Celebration of All Things Local” and is organized by Keep St. Petersburg Local. I'll be honest... it was way bigger than I was expecting. It basically filled the entire park, plus at least 12 food trucks lining one side. One food truck was a double decker bus, with the top level converted into patio seating. I wish I had gotten a photo. Katie and threw down the mats and set up for acro in a shady spot, behind the massage tables (because, of course, the awesome masseuses are also acro-friends). I met Mark and Julie, who are both talented acrobats and incredibly warm human beings. Mark and Julie shared their conditioning warm up with me, 1 minute foot-to-hand drills (this is where the flyer stands in the base's hands) low. I have never before had such an audience for the warm up. At least 30 people were watching Mark and me alternate between me squatting and him pressing me. It was ridiculous, in a good way. In Acrobatics, you always want to calibrate low, before taking a trick up high. Hand-to-hand is basically my favorite thing to train (expect future blog posts on this topic), and flying on Mark was fantastic. I appreciate Mark and Julie's approach: they work slowly, focus on stability, clear communication, and the results are clear. After training, I tracked down some shrimp tacos (with kale and sun-dried tomatoes) and was fortunate enough to have a massage with the lovely Lydia. I honestly cannot recommend her enough.. if you are in St. Pete and looking for a massage, or some body work, she's amazing. I've worked with physical therapists for 10 years, so this praise does not come lightly. Apparently a large portion of the tension in my neck and shoulder is stress related. Lydia told me I have an overactive "fight or flight" response, and that every time I feel my jaw tense, it's because part of my brain is over reacting. This makes complete sense with what I've experienced, and over the past week (it's been a week as of this writing) I've felt my neck and jaw tense even in moments where I thought I was calm. Through breath, I am slowly trying to teach them to quiet and calm. The human mind and body are very curious things. Sunday was the All Florida Acro Jam, this time hosted in Orlando. I packed up my car, added a few extra acro junkies for good measure, and met up with folks from Tampa, Miami, Orlando and St. Pete. The turnout was great - maybe 40 or 50 people. A lot of us played with a trick called Camel Pop - where you take an overhead trick called Camel, and instead of stopping and looking pretty, the base flips the flyer over their head. Here's a video. In short (too late!) I had a pretty epic weekend, and I'm sufficiently in love with St. Pete. Acro, Yoga, Climbing, Festivals, Friends, and Food are pretty much my summary of a perfect weekend.